Animal by-products — what could be more controversial to dog food shoppers than animal by-products? These common pet food ingredients are loathed by many. Yet they’re accepted — and even revered by others. Fans claim animal by-products are nutritionally no different than any other type of meat. And they blame the ingredients’ noted unpopularity on the unsavory mental image they invoke. Critics, on the other hand, insist these ingredients are nothing more than inedible waste of inferior nutritional value. Animal by-products are what’s left of a slaughtered animal after the parts intended for human consumption have been removed. Giblets (livers, hearts, gizzards and necks) as well as other organs can still be sold as edible meats as they are — or used to make hot dogs, bologna and sausage. However, what makes some by-products edible (and others not) isn’t just a matter of what they are but how they’re handled after slaughter. For example, giblets not refrigerated immediately after slaughter but stored for up to 24 hours in a hot offal2 trailer cannot be sold for human consumption. Yet they can still be legally used for making pet food. Likewise, dead-on-arrival animals or other condemned parts3 that have been declared inedible and unfit for human consumption can still be used for making pet food. Inedible by-products not processed into canned pet food can be rendered. Rendering is a process similar to making stew. Except that the stew is intentionally over-cooked. With rendering, the idea is to start with a stew of by-products and cook away the water. Then, skim away the fat and bake the residue. What you end up with is a concentrated protein powder commonly known as by-product meal. In an important 2003 study4, pet food grade by-product meal was compared to feed grade by-product meal. Bottom line? All things considered, pet food grade by-product meals are superior to feed grade by-product meals. Based upon the source of their raw materials, there are two ways to identify by-product meals. Named by-product meals have one thing in common. They all clearly identify the source species of the by-products that was used to make the meal. And although named by-product meals may not be considered the highest quality ingredients, they can be considered acceptable. Because you can never know the source of the meat used to make generic by-product meals, purchase of pet food products containing them should be avoided. Nutritional Differences… Real or Imagined? When comparing animal by-product meals with their “regular” meal counterparts, the differences can be nutritionally insignificant. So, if there’s little nutritional difference between the two, why then do some companies use meat by-products… while others don’t? There’s one glaring and indisputable reason animal by-products remain so popular with some manufacturers… and not others. Animal by-products are simply cheaper… notably cheaper than most any other comparable meat product. They’re used for making dog food because they save money. Not because they’re more nutritious. Why is this important to a pet food shopper? Although finding animal by-products in a recipe doesn’t guarantee you’ve discovered a good or a bad dog food, their presence must always be considered a reliable clue the food is made with cheaper ingredients. 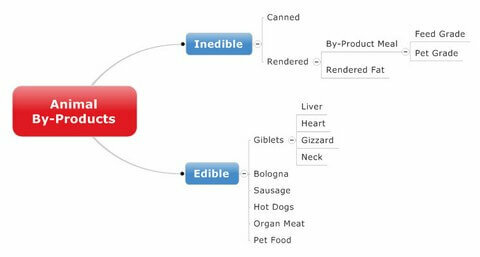 With the sole exception of precisely identified organ meats, two rules will help you more intelligently navigate the confusing world of meat-based dog food ingredients. First, watch what you spend. Never pay top dollar for any dog food that lists animal by-products on its label. And lastly, never buy any dog food containing anonymous animal by-products sourced from materials a manufacturer refuses to clearly identify.